20 years of Taking Back Sunday—it’s almost unbelievable. And at a point in time, this had to be unimaginable for the members of the iconic band themselves. At some point, especially during their earlier years, it had to be unthinkable for these Long Island musical misfits that they would go from the past decade’s “emo” scene staples to today’s genre-defying rock stalwarts. Approaching two decades of Taking Back Sunday’s lasting influence and relevance to rock fans all over the world, the current lineup (Adam Lazzara, John Nolan, Mark O’ Connell, and Shaun Cooper) doesn’t seem to have any intention of stopping. Neither are they just letting this significant milestone go by without a proper celebration. TBS will be embarking on an extensive worldwide 20th Anniversary Tour, which is set to make a stop in Manila. 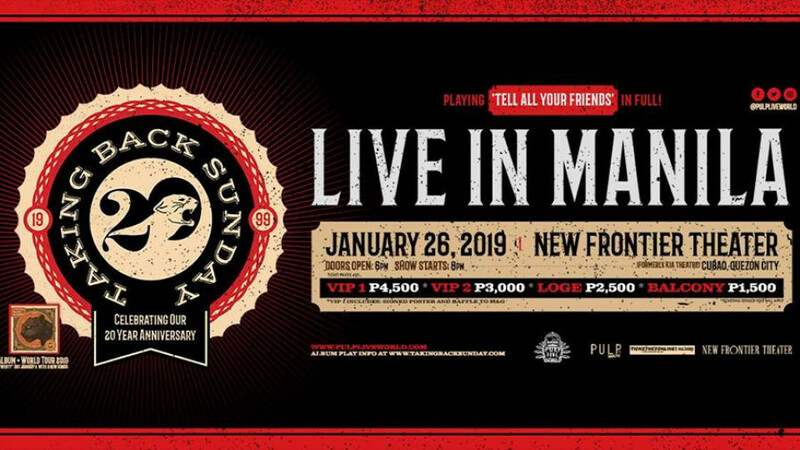 Taking Back Sunday Live in Manila: 20th Anniversary Tour happens on January 26, 2019 at the New Frontier Theater, Cubao! The upcoming concert will be a timely and special celebration of many career-defining moments in Taking Back Sunday’s history, from the release of their landmark debut album Tell All Your Friends—which Taking Back Sunday will be playing IN FULL on this tour—up until their latest album, Tidal Wave. The show will be a rare opportunity to join the band as they celebrate what lies between then and now, at the same time welcoming whatever lies ahead. In addition to the Anniversary Tour, Taking Back Sunday will also be releasing a special collaboration with Craft Recordings. Twenty is a 21-song career-spanning compilation. Slated for release on January 11 as they hit the road, this special release solidifies them as an act with a catalogue that will undoubtedly outlive them. With two brand new songs thrown into the mix, the upcoming collection also hints at the direction the forward-looking band is heading in the coming years. “We hope you can join us for what is sure to be an experience to remember,” Lazzara says, inviting their fans from all over the world to celebrate this special moment with the band. Now, while this won’t be the first time Taking Back Sunday would play for their Manila fans, there’s no doubt about how special the upcoming 20th Anniversary show is going to be—a momentous show that no long-time TBS fan would want to miss. Presented by PULP Live World, Taking Back Sunday Live in Manila: 20th Anniversary Tour happens on January 26, 2019 at the New Frontier Theater, Cubao. Gates open at 6:00PM. We rock and roll by 8:00PM. Tickets go on sale on November 17, 2018, 10AM at all Ticketnet outlets and online via www.ticketnet.com.ph. Tickets are are priced as follows: P4,500 (VIP 1 Standing, includes Signed Poster and Raffle to M&G), P3,000 (VIP 2 Standing), P2,500 (Loge), and P1,500 (Balcony). Ticketing service charges apply.